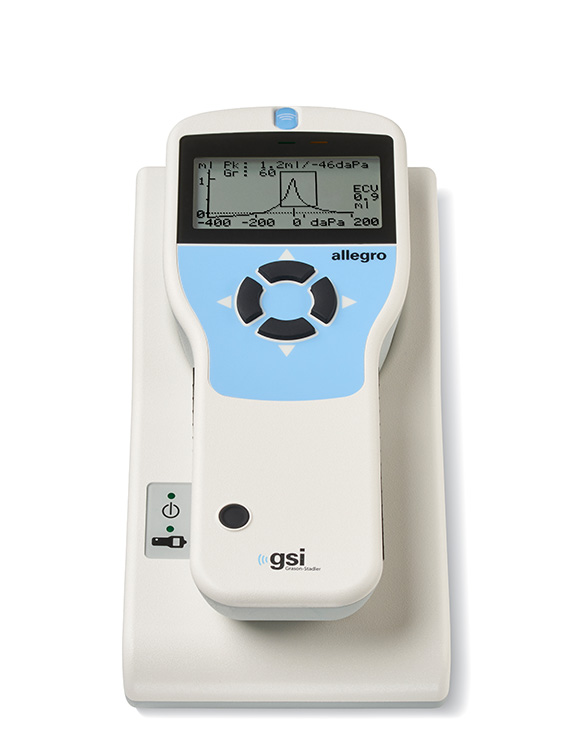 The GSI Allegro™ is a new handheld screening device ready to take on any testing environment that requires tympanometry and ipsilateral reflexes. The Allegro offers quick and easy testing with a logical four button navigation and user configurable test settings. 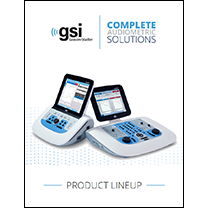 Automatic measurements of middle ear status are completed in seconds. The Allegro includes a portable charging cradle, thermal printer, and carrying case. With the Allegro, a tympanogram automatically begins recording as soon as the ear canal seal is obtained. No additional button presses are needed. Therefore, testing can be completed quickly with challenging patients. Perform a tympanogram on a single ear in as little as three seconds. Quick testing is crucial for testing a diverse patient population. New staff can begin testing with confidence within a few minutes. The Allegro is a device that is easy to use and easy to train users, with its four button navigation and logical interface. The Allegro is ideal for situations such as a satellite clinic where a lightweight device that is easy to transport is important. The device also comes with a carrying case. A signature feature on many GSI products, the Allegro provides a simple four button navigation pad. With just a few button presses, you can conduct testing for both tympanometry and acoustic reflex threshold measurements, as well as review and print results. Quickly obtain a seal for tympanometry. Once a seal is obtained, testing begins immediately. Four key tymp measurements include peak pressure, ear canal volume, tympanometric width, and admittance at peak. Global settings such as test sequence and test prompts may be defined by the user. The Allegro is designed with portability in mind. The device is lightweight and perfect for any testing environment. Four button navigation simplifies the testing procedures for a fast paced testing environment. Test multiple patients and manage the data at your convenience. The Allegro can store up to 32 patient test results to be analyzed and managed at a different time. The Allegro comes with a portable charging cradle. A fully charged device will last approximately eight hours for testing. Seamlessly print from the cradle when the device is connected to the charging cradle.